Telenor introduces once again such an exciting calling feature for its valued Talkshawk subscribers of Pakistan. As we all know this network always brings phenomenal calling packages for Talkshawk SIM users and at this time it has launched unlimited calling& SMS offer for twelve hours in affordable rates. This is mind-blowing feature for all those cellular operators who really want to make lengthy call through his/her mobile phone so they just need to get this feature and avail non-stop calling facility on any same network numbers by using it. This service is only available for Talkshawk subscribers but they can make call also on Djuice numbers by using this feature. This feature is providing mind-blowing service for making countless call on same network numbers after activation this offer with reasonable charges. This network is also giving unlimited SMS service for sending message any local networks of Pakistan through this feature. This service is available all across in Pakistan and all the Telenor customers who are using Talkshawk SIM connection can easily avail this service from anywhere in Country. This network always announces packages with reasonable rates and it is also giving cheap subscription charges of this offer of all its Talkshawk users. They can easily afford this package for using on daily basis without any issue and this package is providing facility for keep in touch with your friends and social media buddies. 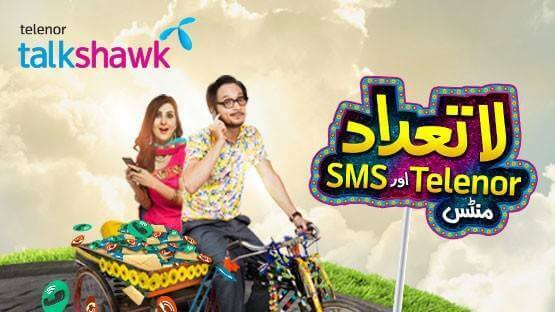 The further details of Telenor Talkshawk Saat Se Saat Offer are mentioned as below. Customers can activate this feature by dialing *5*727# then press call button. Subscribers also get confirmation message from help-center department of this network after activation this feature. Subscribers receive unlimited SMS bundle for sending message on any local network of Pakistan between timing 7 AM to 7 PM. The validity of this feature is for 12 hours. The subscription charges of this package are RS 7.00 plus tax. There are no hidden charges of this service. This package will be automatically DE-activated after end of a day. This offer only can be used between timing 7 AM to 7 PM. This facility is only available for Talkshawk subscribers. This telecommunication reserves authority for changing charges, package timing and incentives at any time without being informed of its users. Subscribers can also avail other Telenor call packages by using this feature.